The Russian prime minister claims that the opposition is preparing to orchestrate falsifications during the presidential elections. As thousands of opposition-minded Russians prepare to monitor the presidential election, Prime Minister Vladimir Putin accused the opposition Wednesday of planning to commit falsifications and then present them as proof of an unfair vote. Putin, speaking to a hall filled with campaign workers, also warned the opposition not to stage unsanctioned rallies after the vote and darkly suggested that an opposition leader might be killed in an attempt to blacken his name. Putin’s remarks were likely to rile first-time observers like Yevgenia Chirikova, an opposition leader and environmental activist who decided to monitor the March 4 vote after Putin refused to cancel the results of the disputed State Duma elections in December. Chirikova, explaining her decision recently at the School of Observers, which is teaching volunteers how to monitor the vote, said she was appalled that Putin refused to heed the tens of thousands of protesters — herself included — who have rallied against election fraud. “I saw Prime Minister Vladimir Putin’s reaction toward the mass protests calling for fair elections,” Chirikova said, bitterly. Chirikova, 35, is joining thousands of Russians in an unprecedented grassroots drive to prevent fraud during the presidential election. The volunteers are coalescing with the School of Observers and other nongovernmental groups to form Russia’s first defense of election observers. “This is the first time that observers have become a mass movement,” said Andrei Buzin, who has years of elections experience as an expert with Golos, the country’s only independent elections watchdog. But the newly minted observers will have their work cut out for them. Even as they have crammed to learn how to recognize fraud, it was unclear whether there would be enough of them to cover the more than 90,000 polling stations across the country. About 15,000 volunteers will be needed in Moscow alone, and half a million nationwide, said Alexei Zakharov, the leader of Citizen Observer, a grassroots volunteer organization that has signed up more than 5,000 people to work as observers. It attracted only 500 for the Duma vote. “More and more volunteers are joining now because they want fair elections,” Zakharov told potential observers at another recent meeting in Moscow. Golos, meanwhile, has gathered some 5,000 observers, while a new project of opposition leader Alexei Navalny called Rosvybory has more than 16,000 people, with a third of them in Moscow. Experts say each organization has to send more than one observer to each polling station to make their work effective and that they should be young and strong. Besides Chirikova, some polling stations will have prominent observers, including journalist Leonid Parfyonov, socialite Ksenia Sobchak and television host Tatyana Lazareva. According to a survey by the Public Opinion Fund pollster, a majority of respondents, 40 percent, think that observers won’t be able to stop falsifications during the election, while 26 percent said the opposite. About 33 percent had difficulty answering the question. The survey was held in late January and released Feb. 6. The same survey showed that 69 percent of respondents don’t want to work as observers, while 20 percent would like to. Zakharov, of Citizen Observer, said that judging by December’s experience, the observers could halve the number of violations. Putin’s campaign plans to send 65,000 observers, while the other four candidates will have a total of about 80,000. Yabloko, whose candidate Grigory Yavlinsky wasn’t allowed to run, will send about 30,000 people as representatives of the party’s newspaper. 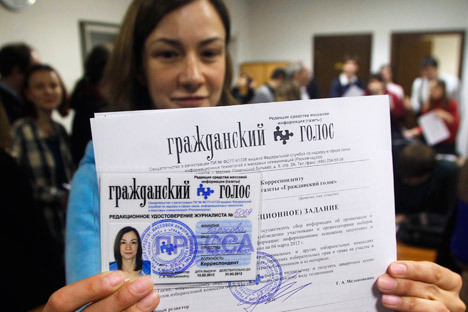 To monitor the vote, all Russian observers must be accredited by one of the campaigns of the five candidates running for president or as media representatives. Golos observers usually act as journalists. A contingent of 160 Western observers from the OSCE will also monitor the election. Central Elections Commission head Vladimir Churov has predicted more complaints about fraud following the presidential vote than after the Duma elections. Spotting fraud does not necessarily mean something will be done about it, said Alexei Zaitsev, a university student who volunteered to work as a Yabloko observer during the Duma elections. Since then, he has been battling to cancel the election results at a polling station based in his former grade school. “I saw that Yabloko’s votes were not stolen, but those for other parties were,” Zaitsev said at the School of Observers meeting. He said he had a copy of the election commission’s protocol that he was using to try to prove the fraud. Zaitsev managed to draw the attention of President Dmitry Medvedev to his case when the president met with Moscow State University students a few weeks ago, but the case was rejected by a court. But thanks to Zaitsev and hundreds of other observers who flooded the Internet with copies of allegedly forged protocols, videos, eyewitness reports and photos of purported vote-rigging, tens of thousands of people believe that their votes were stolen in December and have taken to the streets in authorized and unauthorized rallies. But Putin on Wednesday warned against unauthorized rallies. “We will respect any viewpoint but are calling on everyone to act within the framework of law and use only legitimate means,” he said. He also said his enemies might kill an opposition leader to cause a public outcry against the government. “They are looking among well-known people for a sacrificial victim,” he said. Meanwhile, a leaked internal police document indicates that officers who work at polling stations have been instructed to side with observers in helping resolve any conflict with election officials — a stance that would be the opposite of previous practice, Vedomosti reported Tuesday. Election officials might even face fines if they violate the rights of observers or journalists, the paper said. People planning to act as observers said they wanted to play a role in the country’s future but were unsure how much good they could do at the polling stations. Fyodor Ivashov, a second-year Moscow student studying auditing, said he would like to join many of his friends in working as an observer at the March election for the first time. “It’s a good opportunity to influence the process,” Ivashov said in an interview. He said he is not politically active and hasn’t attended the recent mass rallies. Ivashov said he thought that the observers could influence the outcome of the presidential vote, but only “a little.” “It’s understandable that the voting results won’t be what we want, but we must do everything possible,” said another first-time observer, Juliana Lizer, a 25-year-old documentary filmmaker. Lizer, who has attended the protests, said she couldn’t observe the December elections because of an illness. Lilia Shibanova, the head of Golos, expressed fears that even if a large number of first-time observers showed up, they wouldn’t know what to do. “Some people think it’s just sitting and watching but in reality it’s a hard job,” Shibanova said in an interview. She said Golos observers must attend a class before the election, and only those who pass are sent to polling stations. On election day, the observers have to stay at polling stations during the 12 hours that votes are being cast and then several hours more while the votes are being counted — a process that can last until early morning. Observers are advised to bring snacks, beverages and contact numbers for journalists and a lawyer, and be ready for a long night. Firtst published in the Moscow Times.